Extensive discussions amongst some of the sharpest of my Diaspora via Facebook on this crisis have led to me casting myself (inadvertently) as a serial pessimist. I prefer the term anti-optimist. I have my bounce list like many and I see an easy money trading bounce this week (at least). What I don’t see amid the confident (frequently self-interested) calls of ‘turning-point!’ and ‘generational opportunity!’ is a reason for undue haste. 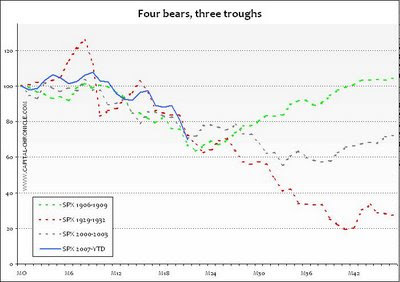 Why should the next 300 points of the SPX be smoothly up in a couple of years (or better)? Indeed, why should even the next 5 years of price evolution turn this episode into the proverbial chart blip on an inevitable ascent? Encouragingly, perhaps, the credit crisis of 1907 took a shade under three years to get back to its 1906 peak level. At the other extreme sits 1929 – 25 years to return to peak. Then there is the 2000 drop. Inextricably, in my view, linked with our current travails it was only in May 2007 that markets got back to August 2000 levels. The point is not to prosecute the apocalypse case. It’s to suggest that economics and equity prices (ex noise) will align but the timing of that marriage is very uncertain given that history (not to mention the ongoing unprecedented dislocations) is suggesting a range of 3 to 25 years. If one thing seems to be clear it is that, even as the ramifications of the issues continue to unfold, the political and social – both in terms of crisis fallout and official policy - are beginning (beginning) to reshape the economic and its subset, the financial, on a global scale. That global aspect is an overweight characteristic of this episode compared to priors. Where it leads recoveries is, for the moment, guesswork.